I have a Coronado PST and wanted to add a portable mount that would allow me to track the Sun automatically. Naturally, I've been looking at the Skywatcher Solarquest and Skywatcher AZ GTi WiFi (since it has a sun tracking option). The latter is more appealing, because it would also make an ideal portable goto mount for my 90mm Maksutov for when I go camping. So I was wondering if anyone has experience with both of these for tracking the sun (naturally, the only scope I'll be pointing at the sun is the PST). I have both mounts and often have WL on one and Ha on the other. The AZGti tracks the sun well and if you use a SynScan handset instead of a mobile then it adds the sun as a target for a 1 star align to the handset, which isn't an option when the SynScan handset is used with my EQ5. The SolarQuest is however incredible and it really is a case of setting up the tripod, levelling, attaching the OTA and powering up. This mount lets me grab sessions in my 30 minute lunch as by the time I've eaten my sandwich the sun is centred in the FOV. If you're looking for a travel mount I'd recommend the AZGti as it tracks the sun well, after you've enabled solar tracking by answering a simple maths question. It can then also be used as a goto at night so offers the best of both worlds. I'd love a SolarQuest but can't justify having yet another mount! They sound fantastic, wish SW did an upgrade to add the sensor and firmware to the AZGTi. As Ade says though, the AZGTi will suit your purposes very well for solar and as a grab and go mount for astro. Don't forget that you will likely need an L bracket to keep the PST upright when fitted to the AZGTi. 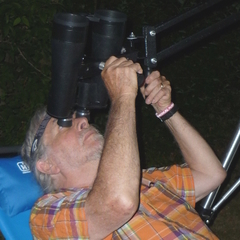 Though I have to say that Steve (@BinocularSky) was quite happily looking into his PST from the side using this mount recently, which I had never even considered. Whatever works best for you though I guess. Thank you both. Sounds like I'll be going shopping for an AZ GTi.